Creative digital photography has developed a long way over the last ten years, but there’s never been a more exciting time to focus on output. However, although most photographers have mastered the skills required for shooting and processing digital files, the pursuit of exhibition quality prints remains elusive for many. Printing With Adobe Photoshop CS4 aims to provide jargon-free guidance for navigating your way through the many factors determining final print quality, so you can produce the very best results from your files. All great photographic prints are made possible by carefully controlled capture, so we start off with Shooting Essentials. Although most minor shooting mistakes can be corrected in Photoshop, it makes a real difference if you can start your print project with a perfectly exposed raw file. Practical Colour Management centres on getting colours consistent through shooting, processing and output and shows you exactly what you need to do with your camera, computer workstation and software, before any editing takes place. With CS4’s expanded non-destructive features, nowadays there’s really only one way to prepare images for print that allows maximum creative freedom. File Processing Essentials and Elective Contrast provides key advice on how to bring the very best of your original image files, followed by Creative Emphasis for giving your files a hand-printed appearance. For those entranced by black and white, Working in Monochrome outlines the key steps for developing and drawing out tone from your files and how to mimic darkroom styles without overcooking. Preparing for Print Out and Printing with Profiles start the business of matching your files to an output media, both sections assuming no prior knowledge of confusing subjects such as resolution, image size and paper profiles. After your first test prints have emerged, Evaluating Prints helps you identify imperfections and shows you how to simply solve them. Creative Print Styles, Creative Print Edges and Alternative Printing kicks off a more divergent approach to making great prints, outlining many techniques for making your work stand out from the crowd. Not all prints need to be made on glossy paper, so it pays to experiment with some of the more luxurious materials on offer. Print Functions, Preview and Soft-Proofing and Print Output Functions cover all the fine-tuning tools in CS4, helping you elevate your files into eye-catching final prints. With an emphasis on the practical, these three sections equip you with all the skills you’ll need to drive your prepared file through the maze of printer software functions. 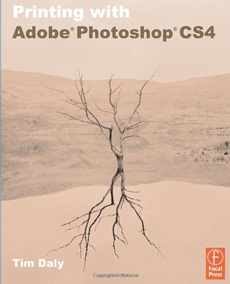 Paper and Media Characteristics, Printer Types and Inks focus firmly on the numerous choices available to Photoshop CS4 users, and most importantly, outline the practical consequences of using them. Digital On-Demand, the penultimate section, illustrates how to get the best results out of a digital press, the latest must-have output fast becoming an essential skill for photographers making photobooks, wedding albums and short-run publications. I found this book a joy to read. I was hoping for a manual which would help improve the quality of my printing - I got that as well as a book which increased my interest in photography. Tim Daly's writing is so easy to read and to follow that I not only learned from the book but also enjoyed the experience. His expert tips and creative emphasis are written in such a way that it was easy to follow. It uses the workflow, computer, software and printer I am familiar with the terminology is clear and it encouraged me to try out the techniques and enjoy the experience. Granted I have seen books with better illustrations, but the book is laid out beautifully, is well written and covers much more than simply this is how to print' Well worth the money. Have you ever returned from a holiday abroad or a family reunion, clutching a memory card full of pictures, only to find them truly disappointing? Badly composed, overexposed, underexposed, red eye, things in the way or in the wrong place. And thatÕs just the beginning. Your photos are in a bad way Ð if they were people, theyÕd be sitting in casualty waiting for treatment! 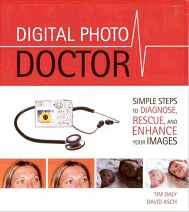 Well, the good news is that the Digital Photo Doctor is now in residence and is waiting to cure your ailing images. Using the affordable and easy-to-master Photoshop Elements software, Digital Photo Doctor will show you, with simple step-by-step tutorials, how to correct, cure and enhance those pictures that would otherwise be heading for the recycle bin. And to make sure it doesnÕt happen again, the Doctor will dispense advice on how to take great pictures in the future. The family snapshot always has the potential to go wrong. This is your chance to learn how to put it right, once and for all. Answering the question: "why digital? ", this title addresses the advantages of digital versus traditional photography. 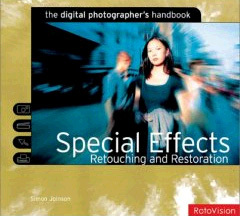 It examines the breadth of special effects and manipulations acheivable using digital technology. The project-driven book aims to show all the processes visually and simply, allowing the digital photographer to follow the manipulations step by step with jargon-free text. Images are dealt with in four logical sections: "shoot it", "scan it", manipulate it" and "print it". The guide also features real-life projects, illustrating how to use digital technology to its fullest capacity.